"My unconscious unfurls into a painting in the same way described by chaos theory,' explains painter Julia Schwartz, "with one small seemingly unrelated movement having an impact on the piece as a whole." Schwartz, an articulate artist who came to painting late in life, always starts with something -- a news event, a memory, a place -- and then lets her brush unfold it in unanticipated directions. 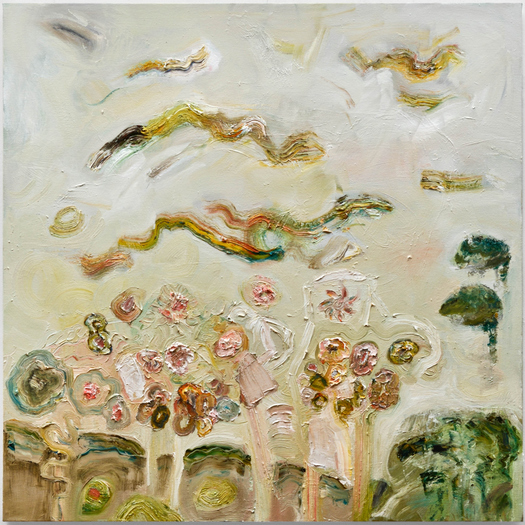 When painting abstractly, Schwartz is an earnest, searching artist who plays fields of painting of distinctive, unfurling forms. When images crop up, as they have been doing more and more in the past year, a more lyric sensibility comes to the forefront. 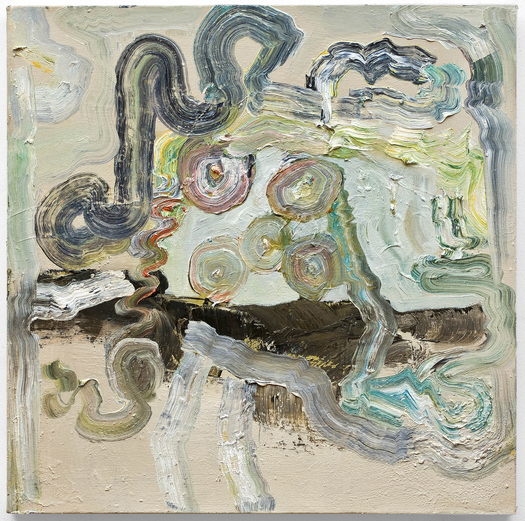 Schwartz is a "searcher," committed to painting as a process of finding, and also to the idea that being too sure of what she finds is something to avoid. "I'm wanting to push farther without over thinking or overworking," is how she explained this in an interview in the blog Studio Critical. Flexible, observant, and pleasingly eccentric in her brushwork, Julia Schwartz creates images that are just a little bit off balance; just as she intends them to be. 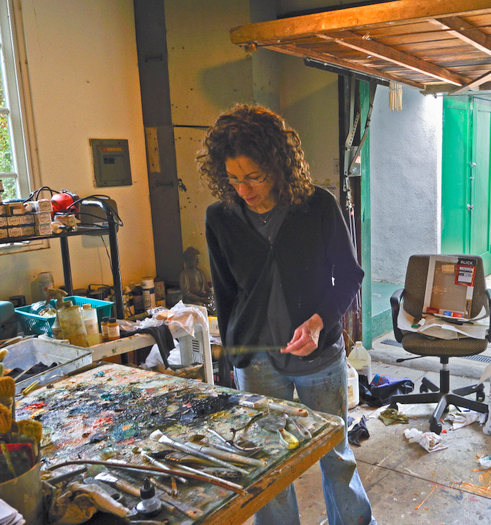 Julia Schwartz: Photo by Gene Ogami John Seed Interviews Julia Schwartz John: How did you get started as a painter? Julia: I guess I would say I began life in art and took a very long hiatus before pursuing it as a second profession. I drew most of my life, especially in childhood. Then I spent many years in another profession, one in which I am still active: I work as a psychoanalyst and therapist. When my daughter was young, I began taking her to an art class and after a while I began taking classes myself- life drawing for a few years and then a painting workshop for a couple years. It was a good foundation and I appreciated the mentoring from my teachers but after a while, I decided to work on my own, and so we transformed our garage into a studio space, and I began working steadily there. Julia Schwartz, "Driving Into Big Sky," 2011, oil on canvas, 60 x 48 inches John: You have said that you go to the studio without preconceived ideas. Once you are at your easel, how do you get the ideas to begin to flow? 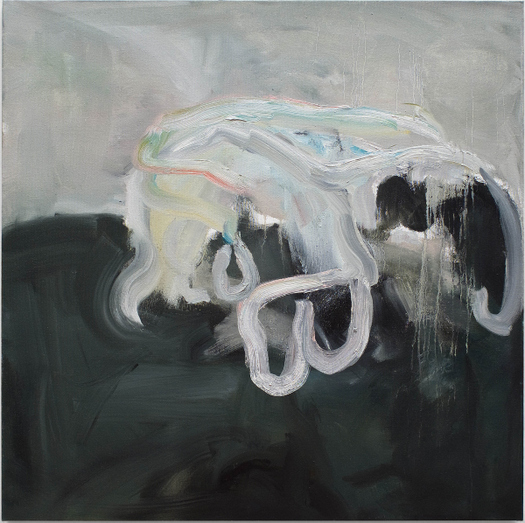 Julia Schwartz, "Ice XXV, After the Visit," 2011, oil on canvas, 20 x 20 inches John: Your work is generally abstract: but is it true that bits and pieces of recognizable images are appearing with greater frequency? 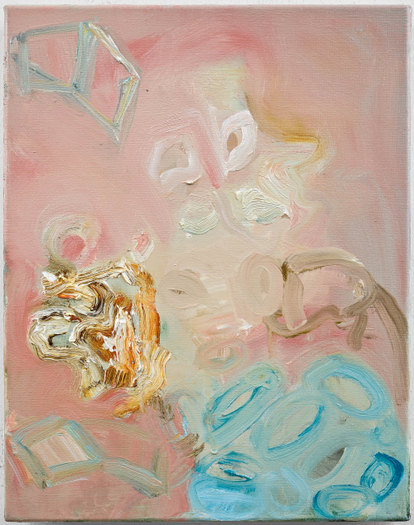 Julia: I think prior to 2011, my work was primarily figurative although it was becoming more and more abstract. The shift came in 2011, at the time of the Japan earthquake and tsunami. I began painting islands and icebergs, shapes that took the place of figures. The emotional feelings in the paintings were very much the same, however. The first paintings were little studies about what it was to be an island geographically and metaphorically- I think my feelings for Japan, and even before that, Haiti, and the tsunamis before that-- all of that maybe factored into those paintings and that shift. And then I took some pieces of writing, grief poems into the studio. One line in particular -- 'Ice immobile in a hollow sea melts no more' -- became a starting point for a series and also the title of my last one person show The Hollow Sea. Subsequently, the line between abstract and figurative, that distinction doesn't seem relevant. I paint, and sometimes the painting has bits of recognizable imagery -- I like how you put it! -- and sometimes it doesn't. 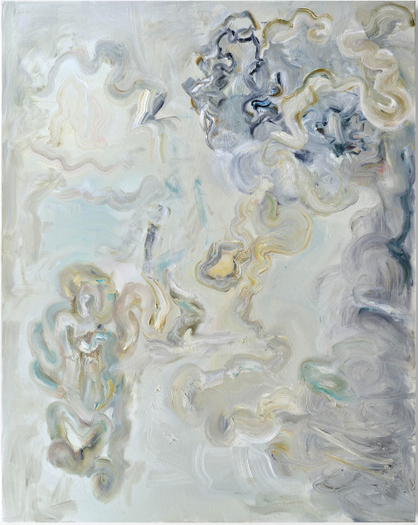 Julia Schwartz, "Ice XIV, Atmospheric," 2011, oil on canvas, 36 x 36 inches John: How has your painting changed in the past year? Julia Schwartz, "Girl with Red Hair and Blue Dress," 2011, oil on linen, 14 x 11 inches John: What kinds of reactions do your paintings elicit from viewers? Are you surprised by the reactions, or do you find that people "read" the paintings the way you would expect. Julia: I am always interested, sometimes surprised, and often quite moved by people's reaction to my work.